Like Earth, space has weather. Except instead of swirling winds and downpours of precipitation, space weather is defined by shifting electric and magnetic fields and rains of charged particles. At the very beginning of space, starting just 60 miles above Earth’s surface, there’s a layer of the atmosphere that shifts and changes in concert with both types of weather. Above the ozone layer, the ionosphere is a part of Earth’s atmosphere where particles have been cooked into a sea of electrically-charged electrons and ions by the Sun’s radiation. 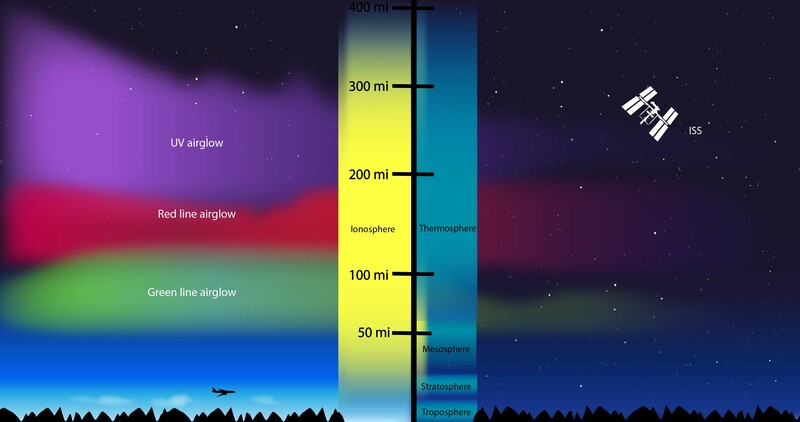 The ionosphere is comingled with the very highest — and quite thin — layers of Earth’s neutral upper atmosphere, making this region an area that is constantly in flux undergoing the push-and-pull between Earth’s conditions and those in space. Increasingly, these layers of near-Earth space are part of the human domain, as it’s home not only to astronauts, but to radio signals used to guide airplanes and ships, and satellites that provide our communications and GPS systems. Understanding the fundamental processes that govern our upper atmosphere and ionosphere is crucial to improve situational awareness that helps protect astronauts, spacecraft and humans on the ground. Two new NASA missions are teaming up to explore this little-understood area that’s close to home but historically hard to observe. The Global-scale Observations of the Limb and Disk, or GOLD, instrument launches aboard a commercial communications satellite in January 2018, and the Ionospheric Connection Explorer, or ICON, spacecraft launches later in 2018. Together, they will provide the most comprehensive observations of the ionosphere we’ve ever had. The ionosphere is a region of charged particles in near-Earth space that coexists with the neutral gases in the upper atmosphere, which are sometimes shaped by weather events in the lower atmosphere. The two missions provide distinct but complementary perspectives: ICON, in low-Earth orbit, flies directly through and just above regions of interest, capturing detailed remote and in situ data on the forces that shape this area. GOLD, in geostationary orbit over the Western Hemisphere, will build up a full-disk view of the ionosphere and upper atmosphere every half hour, providing detailed large-scale measurements of related processes — a cadence which makes it the first mission to be able to monitor the true weather of the upper atmosphere, rather than the longer cycles of its climate. GOLD is also able to focus in on a tighter region and scan more quickly, to complement additional research plans as needed. From its geostationary orbit, GOLD will have a continual view of Earth and its outer atmosphere. This visualization shows the view of Earth from GOLD. Because GOLD remains situated above the same geographic longitude, ICON will pass through its field of view. The two will take complementary measurements from different vantage points, making it easier to identify what caused a given change in the ionosphere. The missions could be likened to photography we're familiar with on Earth. GOLD specializes in landscapes from its view 22,000 miles above the planet’s surface and ICON — at 350 miles above Earth — captures detailed close-ups. During parts of its orbit, ICON passes through GOLD's field of view and each mission will get a unique snapshot of the same region. This overlap in their data makes it easier to identify what caused a certain change to the upper atmosphere at a given time. One shared goal for the missions is to systematically measure weather-related shifts in the upper atmosphere. For the first time, we'll be able to see how the upper atmosphere changes in response to hurricanes and geomagnetic storms alike. "We used to think only solar wind could affect the ionosphere, and only the lower atmosphere was affected by terrestrial weather," said Doug Rowland, ICON mission scientist at NASA's Goddard Space Flight Center in Greenbelt, Maryland. The solar wind is the Sun’s constant outflow of charged particles and magnetized material. "But now we're going to get to see how that energy couples together." Several types of terrestrial weather events are of particular interest. Scientists from the University of California, Berkeley, for example, have developed a theoretical model of El Niño's repercussions on the ionosphere. Their model suggests El Niño-driven warming of the Pacific Ocean causes an increase in water vapor, which in turn increases the amount of solar energy the atmosphere absorbs. That added heat causes wind patterns to fluctuate and alter conditions in the ionosphere. Tropical cyclones are also suspected to have effects on the ionosphere. Data from ICON and GOLD are expected to answer these questions and further reveal unanticipated mechanisms at work. Bright swaths of red and green, known as airglow, are visible in this time-lapse view of Earth's limb captured from the International Space Station. Airglow occurs when gases in the upper atmosphere become charged by the Sun's radiation, emitting light. By measuring the light from airglow, ICON and GOLD will learn a lot about the neutral and charged particles in the upper atmosphere. In addition to working together to determine how different types of energy flow through the upper atmosphere, the two missions also have their own research objectives. GOLD's science focuses on observing what drives change — the Sun, Earth's magnetic field and the lower atmosphere — in the upper atmosphere. GOLD is particularly interested in how the upper atmosphere reacts to geomagnetic storms, which are temporary disturbances of Earth's magnetic field set off by solar activity. During nighttime, GOLD examines disruptions in the ionosphere — dense, unpredictable bubbles of charged gas that appear over the equator and tropics, sometimes interfering with radio communications. On the other hand, ICON concentrates on how charged and neutral gases in the upper atmosphere behave and interact. Several forces — including shifts in neutral winds, pressure gradients and solar activity — act on the ionosphere simultaneously; ICON was designed to study each of them individually, making it easier for scientists to elucidate cause-and-effect relationships. ICON and GOLD join a small fleet of spacecraft that study a vast interconnected system from the space surrounding Earth and other planets to the farthest limits of the Sun’s constantly flowing streams of solar wind. A third mission in the fleet — the 16-year-old Thermosphere, Ionosphere, Mesosphere Energetics and Dynamics, or TIMED, will specifically complement the new efforts to study the upper atmosphere. TIMED, which launched in 2001, doesn't carry all the instruments necessary to analyze the motion of the particles in the upper atmosphere that ICON and GOLD bring to the effort, but it still can provide key measurements from a third vantage point to help scientists fill in pieces of the puzzle. Together they will provide key information about how Earth’s upper atmosphere connects to the dynamic and complex system of space that fills our solar system. The last time Earth's disk was seen in far-ultraviolet light was in 1972, during the Apollo 16 lunar landing mission. 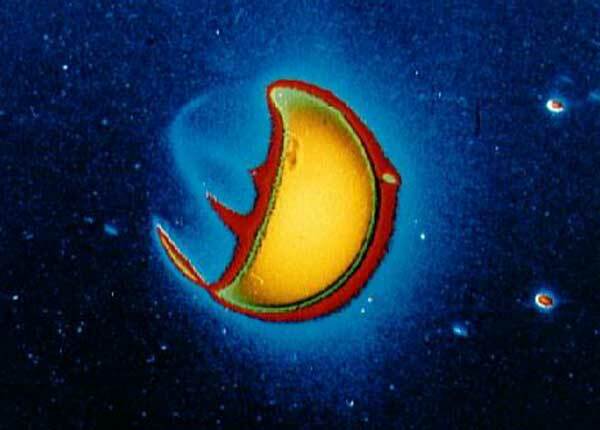 Astronaut John W. Young used a UV camera to take this photo of Earth from the moon. GOLD will have a continuous view of Earth's atmosphere in far-ultraviolet light, allowing scientists to see changes to the ionosphere and thermosphere that are otherwise invisible. ICON and GOLD are Explorer-class missions. NASA Goddard manages the Explorer Program for NASA's Science Mission Directorate in Washington, D.C. UC Berkeley's Space Sciences Laboratory developed the ICON mission and the two ultraviolet imaging spectrographs onboard; the Naval Research Laboratory in Washington, D.C., developed the MIGHTI instrument; the University of Texas in Dallas developed the Ion Velocity Meter; and the ICON spacecraft was built by Orbital ATK in Dulles, Virginia. GOLD is led by the University of Central Florida, and the Laboratory for Atmospheric and Space Physics at the University of Colorado Boulder built the instrument. GOLD is a NASA mission of opportunity — an instrument hosted on an otherwise unrelated satellite. GOLD flies in geostationary orbit on a commercial communications satellite, SES-14, built by Airbus for Luxembourg-based satellite operator, SES. GOLD is the first NASA science mission to fly as a hosted payload on a commercial communications satellite. NASA Goddard manages the TIMED mission for the Heliophysics Division within the Science Mission Directorate at NASA Headquarters in Washington, D.C. The Johns Hopkins University Applied Physics Laboratory in Laurel, Maryland, built the spacecraft for NASA.